This popular HD production system combines high-speed, large-capacity, solid-state memory, the latest HD imaging technology, and advanced Panasonic engineering. Dubbed the P2HD Series, the new HD/SD multi-format production system records onto the P2 card. This solid-state memory device provides the P2HD Series with outstanding reliability, high transfer speeds, excellent rewritability, and extended recording times. The P2HD Series is also the world's first to support the latest HD codec, AVC-Intra. In addition to its DVCPRO HD mode, the use of this advanced new codec brings higher image quality and longer recording times to the P2HD Series, in a wide product line that meets the needs of broadcasting, moviemaking and professional video production. The P2HD Series has no transport mechanism, saves maintenance cost, improves reliability, and is designed for easy reuse to aid global conservation. While responding to emerging needs, the P2HD Series brings a host of solutions to the future of broadcasting and video production. Since the introduction of P2 some 10 years ago we have seen improvements made to the P2 media with the ‘R’, ‘A’, ‘E’ and ‘F’ series P2cards and more recently the introduction of the microP2 cards. The reliability of these P2 cards is such that many of the early series cards are still in regular use today. However times change and Panasonic has not only improved the P2 media but has also introduced new AVC-ULTRA codec’s. The AVC-ULTRA codec family is the general term for AVC-Intra, AVC-LongG and AVC-Proxy codecs which comply with the H.264/AVC standard. 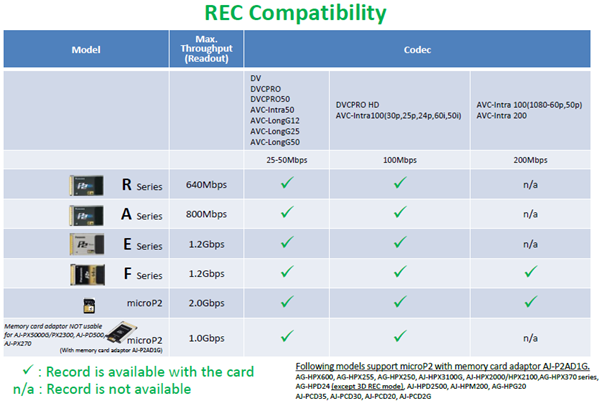 The following table shows the various P2 media cards and which codec / frame rates they are compatible with.